They don’t make ‘em like they used to. Old epics are usually better than new ones. Seriously, I’d rate Spartacus (1960) higher than Gladiator (2000), Tora! Tora! Tora! higher than Pearl Harbor, and The Ten Commandments (1956) higher than this year’s Noah or probably Exodus: Gods and Kings (based on the trailers I’ve seen for it). Older films have a more laid-back approach to their storytelling. They don’t need an attention-grabbing opening scene, but they gradually take hold of the audience until we are deeply invested in the characters without knowing exactly when or how it happened. Modern films like Braveheart and Schindler’s List have an old-fashioned feel to them, which is part of the reason why I like them so much compared to other epic films. And that brings us to the 1960 classic Exodus. This film is about the birth of the modern State of Israel in 1948. It was made back when Israel was still a serious underdog and when the Holocaust wasn’t an old part of history but a fresh memory burned into people’s minds like an open wound. This was before the Six-Day War and the Yom Kippur War, both of which put Israel’s very existence in jeopardy. This movie reflects the seriousness of the time it was made in. Let’s explore some of the things that make this three-and-a-half-hour film worth watching today. Paul Newman and Eva Marie Saint headline this film as Jewish freedom fighter Ari Ben Canaan and American nurse Kitty Fremont, respectively. They have an interesting love story because she is mourning her husband who was killed during a border skirmish in pre-Israel Palestine and he seems to have nothing to lose by constantly putting himself in harm’s way. They make an odd couple. She’s a Presbyterian and he’s a Jew, and they have completely different perspectives on the world. He’s obsessed with his Jewish identity and the fact that he must fight for a national cause. That pushes her away at first, but the more she comes to know him and his people’s struggle, the more she desires to unite with him and his cause. While their love story is compelling by itself, Exodus gives us another one that completely overshadows the first in the form of a 15-year-old girl named Karen and a teenage boy named Dov Landau. They are both Jewish survivors of the Holocaust, and they responded to the horrors they witnessed in completely opposite ways. She has had her heart broken, which has softened her to the point where she is ready to love everyone she meets because she sees how precious and fragile life is. Dov, on the other hand, has been hardened by his experiences. He is filled with bitterness and anger over the atrocities he has suffered, and he is willing to kill anyone who stands in the way of what he sees as justice. Their two personalities are brought out perfectly by the stories they tell. Karen tells Dov what happened when the Nazis took over Denmark and forced all the Jews to wear the Star of David on their clothes. But the King of Denmark and all of the other Danes started wearing the Star of David, too, proving to Dov that not everyone is bad at heart. Later, Dov recounts his gut-wrenching experience at Auschwitz to some Jewish freedom fighters. He helped the Nazis get rid of the bodies of his fellow Jews after they were killed in gas chambers. He was even raped and humiliated by his captors, which is why he feels the need to bury his shame with fury. Karen and Dov spend time together at the start of the film, get split up for the middle part of the film, and then meet up again at the end. She is such an angel and he is a brutal, broken boy. It seems like they’re not a good fit at all, but it turns out that they are perfect for each other, and my heart aches to see them together again every time I watch this film. Their beautiful love story is what really sets Exodus apart for me. Even though Exodus is telling the story of Israel’s birth, it isn’t completely one-sided in the Jews’ favor. It offers a surprisingly balanced perspective on the Jews. Some fight with violence while others fight with diplomacy. There is a lot of bickering between the two main factions vying for control of Israel before and after it is formed. One Jew even admits that the Arabs can make just as valid arguments as the Jews for a homeland in the disputed land of Israel. The conflict between Jews and Arabs is personified in Paul Newman’s Ari Ben Canaan and John Derek’s Taha. Taha is the son of a prominent Arab landowner who gave some land to Ari’s father to set up a school for Jewish children. Taha and Ari grew up together and learned that it is possible for Jews and Arabs to live together in peace. But when the United Nations votes in favor of the Partition Plan for Palestine, Taha suddenly finds himself a minority in his own home, and he has to cut himself off from his old friend. He cannot bring himself to fight against his fellow Muslims, neither can he turn against the Jews he loves. In the end, he pays dearly for his friendship with Ari. Taha’s fate represents the serious challenge of finding a peaceful solution to the conflict between these two peoples. Interestingly, John Derek played the Israelite leader Joshua in 1956’s The Ten Commandments. Maybe that’s why his character’s love for Jews runs so deep. Exodus may not be on the same level as Lawrence of Arabia or Bridge on the River Kwai, but it is still a very good epic film. And its subject matter is quite unique in cinema. Can you imagine a movie like this being made today? Probably not. But I’m glad this movie exists. It offers a hopeful, if somewhat melancholy, message about the future of Jews and Arabs in the Middle East. Watch this movie and you’ll be amazed by the emotional journey it takes you on. 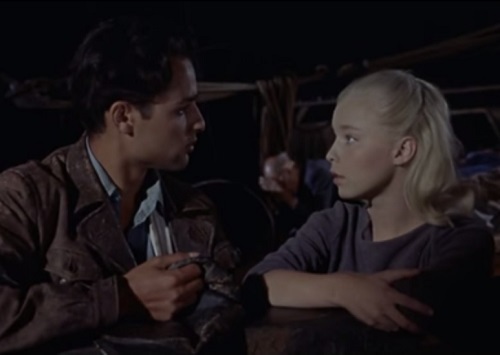 This entry was posted in Forgotten Film Gems and tagged classic films, exodus, films, Israel, leon uris, love, movie review, movies, movies based on books, paul newman, relationships, romance, war. Bookmark the permalink. Karen = Xavier and Dov = Magneto? Ooh, I like it. They both have the same goal of freedom and peace for their people, but they have completely different ways of achieving it. One fights those he sees as oppressors while the other tries to persuade and use vigilance and reason to get what she wants. Very cool connection! I haven’t watched Exodus, but I do own the DVD. I bought it just to view the scenes filmed in Cyprus. From your review it sounds like it has so much more to offer. Nice! The locations are beautiful in that movie. The story and characters that populate the landscape make it that much more awesome. I hope you enjoy it. Sounds like a movie I will enjoy. I will add it to my humongous to-watch pile. Plot and character are out. Action and noise are in. But plot and character still produce a better story.